White Wines with a Different "Dimension"
Mauro Cirilli is the wine director of Perbacco ristorante + bar and the newly opened barbacco eno trattoria. While living in Italy, Mauro attended the three-year Italian Sommelier Association Program and worked as sommelier at the celebrated il Cibreo. He went on to work as assistant sommelier at the renowned La Rivista in the Hotel Ca’ Pisani in Venice, as well as five-star hotels, including Hotel Baglioni and Hotel Danieli. 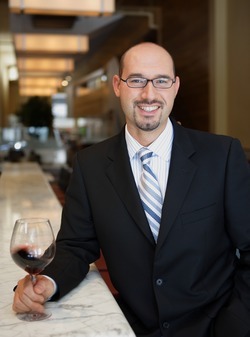 Mauro moved to San Francisco in 2001, and became the lead sommelier at Aqua. In 2006, Perbacco opened with Mauro as the wine director, garnering a number of national wine awards. With the Perbacco team, Mauro opened barbacco eno trattoria in 2010, and continues to oversee both wine programs. You may already know that white wines are made slightly differently from red wines. While with red wines the skin and seeds are kept in contact with the juice during the fermentation for a period of time to allow extraction of color and tannins, with white wines usually the skins and seeds are removed immediately before fermenting. In the last fifteen to twenty years, things have changed. A few producers from Italy, mostly from the northeast regions, have been experimenting with a very old and almost forgotten technique of longer skin maceration for white wines. While in the last century, the market required a more pristine and clean style of whites, which commands more manipulation; these winemakers are going back to how wine used to be made thousands of years ago, when technology did not exist and the product was more natural. Contact with the grape skins extracts not only color and tannins, but also minerals that bring to the actual wine a different “dimension.” It is best to say that these wine producers are very strong believers in natural winemaking, where wine must represent the unique terroir of the vineyards. To describe these non-conventional wines, wine journalists around the country started using the term “orange wines,” referring to the color that can vary from a dark yellow-orange to dark-golden brown. For me, the most exciting thing is not the color, but the dimensions of these wines; I’m referring to their texture, mouthfeel, and depth. This style of white wine is denser and richer, with good weight on your palate. The presence of tannins and minerals add more complexity and a full flavor profile. They have unique aromas that can vary from apple or pear cider to warm spices, from baked fruit to earthy notes. Because of their texture and depth, these wines are very food friendly. They are definitely different compared to many other everyday whites available in the mainstream market. Angiolino Maule, from the town of Gambellara, 25 miles east of Verona, makes one of my favorite whites, Sassaia, which is made with Garganega and Trebbiano grapes. He believes strongly in organic viticulture, where the use of chemicals is totally avoided in the vineyard in order to protect all the micro-organisms present in the soil. The vine roots are therefore able to extract important minerals from the volcanic soil of the vineyards. After harvest, he macerates the grapes with skins and seeds for 24 hours, and then begins fermenting without using any added yeast except the indigenous one present in the grape. The wine is then aged in large barrels for almost 10 months before it is bottled without any filtration. Sassaia is so different from any other white wines produced using Garganega and Trebbiano: the color is lightly orange, with aromas of apple cider, orange peel, honey, and nuts; and its texture is quite remarkable, with the presence of light tannins and great minerality. Sgaravatti makes a wine named Anfora, using Friulano grapes (previously know as Tocai Friulano) following the technique he learned from Gravner. He puts the grapes in the amphorae so that their juice goes through maceration and fermentation in contact with skins. After six months, the skins are removed and the wine is left to age eight more months. During this process there is no use of any temperature control, no addition of sulfites, and no filtration. This wine has a dark cloudy orange color, with lots of earthy aromas, warm spices, and resins. The texture is bold, very dense and thick, with tannins and minerals present in good quantity…a wine that truly comes from the soil! Maule and Sgaravatti are just two examples of producers that are going back to the old, traditional winemaking technique that unfortunately had almost been forgotten. It is going back to our original roots; the connection between the man, the vine, and the soil.